Our company operates from more than 40 years in the field of the revision of rebuilding tannery machines of every brand and model. 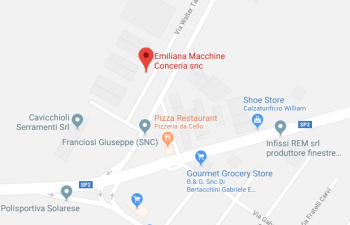 Our experience and reliability allowed us to be known in Italy and all over the world finding a good appreciation over all about Rizzi machines, but also on Mercier, Flamar, Turner, ITM, 3P, Mosconi etc. Our rebiuldings consists in real reconstructions that allow our customers to have machines as new. The workmanships that we effect on each machine that we rebuild start from the complete dismantlement and then continue with a deep cleaning of the loom and all the mechanical parts with the substitution of pins, bushings, bearings and consumable parts; the hydraulic system is completely regenerated while all the pipes and the components are furnished new as well as the electric plant and we conclude with a resistant painting. Thanks to the experience matured in the time we have adopted some shrewdness that allow our machines to have continuity, reliability and resistance that persist in the time. The machines revised from us are covered by a guarantee on all the mechanical parts and to take good care at the requests of every client they are done custom designed. Our clients' visits during the workmanship, or in phase of completion, are always welcome. Upon specific request, we supply certification for the safety of the worker through asseverated skill. If requested we deal also with new machines or ex tannery machines. At side find the connections to our fotogallery with some images of the machines rebuilded from us as shaving machines, fleshing machines, scudding machines, splitting machines, sammying and setting out machines, sammying machines, drums, ironing and embossing machines, buffing machines and many others. For technical applications or commercial information we are at your complete disposal. You may connect to the contact page.